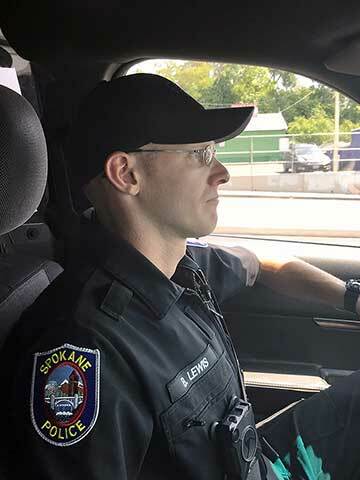 Thursday, August 2, 2018 at 11:09 a.m.
A Spokane police officer is rejecting the notion that he’s a hero after his quick thinking helped to save the life of a 5-year old boy. Officer Brad Lewis was patrolling North Spokane when heard about the incident on his radio. “So our dispatcher’s put out there was a child, five- years old, who was not breathing and was unresponsive,” recalled Lewis. Lewis realized he was only a few blocks away and raced to the child’s home where he arrived before firefighters were on-scene. “Show up and see the sister in the front yard flagging me down and realize fire is not there yet and we’re going to have to do something,” Lewis said. Fortunately, Lewis had received nine months of medical training in the U.S. Army and took over performing CPR from the boy’s panicked father. “When I came up his lips were blue, unresponsive, eye’s had rolled back in his head. I’m doing CPR, obviously pushing pretty hard. At that point my partner tells me he’s beginning to blink. So I let up for a second and he coughs and then we lose him again,” lamented Lewis. The officer did more CPR as young Keenan’s frightened family looked on in the child’s upstairs bedroom. “Got a pulse!” announced a paramedic. “We gotta pulse? Oh God thank you guys!” exclaimed Keenan’s relieved father. Keenan’s parents say their son had suffered a seizure while taking a nap and then choked on his own vomit. They feel thanks to Officer Lewis’ quick actions, their child didn’t suffer any brain damage and now taking medications to prevent seizures. So as you might expect, Keenan’s parents are very impressed with Lewis’ life-saving skills. “We are very grateful and we would love to see him and have him over for dinner, if at all possible. Without him, we wouldn’t have our boy at all today,” Malia Woods said. Lewis credits his training with allowing him to keep a cool head in chaotic situations, whether it’s fighting crime or saving lives. “It felt good, especially when he came back to and kinda looked at me. His parents were really excited. They were really happy. The emotion on their face kinda made it worth it,” Lewis said with a smile. Lewis saved Keenan’s life about a week before the officer completed his probationary status with the Spokane Police Department. He is now full-fledged officer. “This job really is, when it comes down to it, we solve problems. Usually it’s an emergency right? That’s why we’re called and people look at us for a solution to a problem,” Lewis said of his new career.